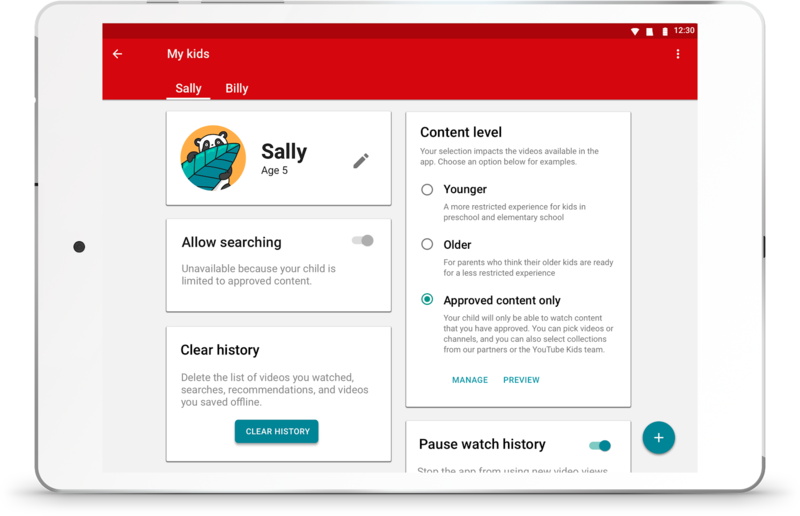 Back in April, Google announced that it was readying new features for the YouTube kids app to give parents greater control over the content their children are able to access. The ability to carefully select every channel and video available on the account is now going live, as well as a new experience for ‘Older’ kids. There are now three different content level settings. ‘Younger’ is the default level users have been getting up to now, ‘Older’ is a new level for children aged between 8 and 12, and ‘Approved content only’ enables strict parental curation of everything that can be accessed. We saw evidence of these new settings in one of Cody’s recent teardowns. Levels can be changed from the child’s profile page, where you’ll also get a preview of what it will look like. The approved-only content setting will disable search for the kid, with the onus on the parent to seek suitable content and add it to the account (see above GIF). The new tools are available in the Android app for US users from today and will be coming to other regions and iOS in the near future. Some of the changes may come via a server-side switch, but there was a new version of the app released yesterday, so it can’t hurt to install that — we also have it at APK Mirror.